Ribbons were cut and doors opened on October 25th at KinderSmile Community Oral Health Center (KSCOHC), 10 Broad Street, Bloomfield. 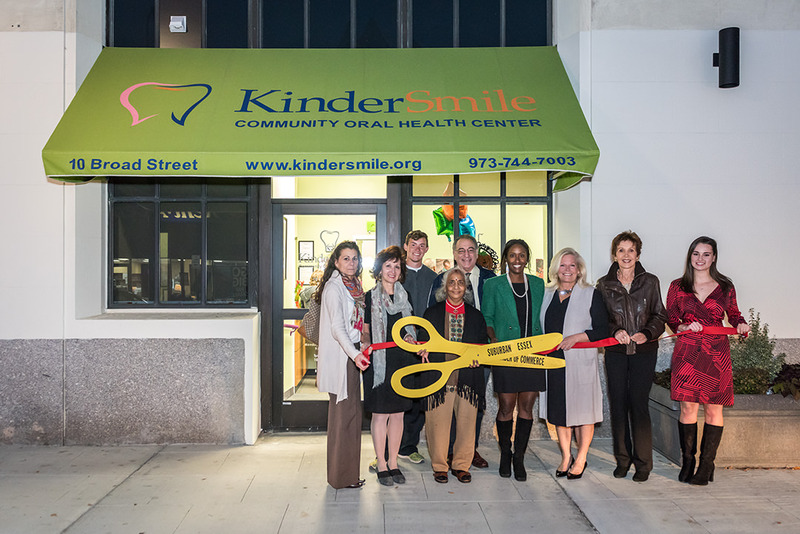 Suburban Essex Chamber of Commerce members, business leaders, dental and health care professionals as well as KinderSmile Foundation trustees, friends, and staff joyously celebrated the realization of a longtime goal–a Dental Home for underserved children age 0-17. Tours of the state-of-the-art dental clinic and talk of present & future plans marked the evening’s festivities, which reinforced KinderSmile’s commitment to eradicating pediatric dental disease. Guests were equally moved by stories of the extreme need for this facility, whether they had just been introduced to KinderSmile Foundation or had been toiling in the dust & wire-strewn construction site as KSCOHC came to fruition right before their eyes on the “soft” opening day, August 29th. Since that date, nearly 500 children have benefited from the new Dental Home. Children can often be seen everywhere, learning interactively at our Education Station, practicing oral healthcare at the Toothbrush Station and receiving dental care in a placed created just for them. Smiles abound; healthy ones!